Fire crews are struggling to contain an explosive wildfire that started Saturday afternoon in Lake County and swelled to 50,000 acres and growing. The Associated Press reported that one person was killed and more than 400 homes and businesses were destroyed. The fire — which residents and firefighters are calling the Valley Fire — spread to Napa County, destroyed structures and prompted over 10,000 evacuations, according to Cal Fire. Officials reported zero percent containment early Sunday. The fire grew from 40,000 to 50,000 acres during the day, officials said. Cal Fire spokesman Daniel Berlant said wind gusts that reached up to 30 miles per hour sent embers raining down on homes and made it hard for firefighters to stop the Lake County blaze from advancing. There's no official tally of the destruction yet because firefighters are focused on new evacuation orders and on residents' safety, but at least 100 homes have been destroyed, he said. "This has been a tragic reminder to us of the dangers this drought is posing," Berlant said. Roughly 5,000 area residences are without power, Cal Fire officials said of the fire, which on Saturday sent four firefighters to the hospital with second-degree burns. Its cause is under investigation. One thousand firefighters from Cal Fire, South Lake County Fire Protection District, California Highway Patrol and Lake County Sheriff's Department had responded to the blaze as of Sunday morning. They were assisted by 125 fire engines, four air tankers, 16 dozers and 15 water tenders. People leaving Middletown dodged smoldering telephone poles and drove through billowing smoke Sunday. They said there were burned buildings in downtown, but the heaviest damage was farther out, where homes and apartment complexes were destroyed. Also on Sunday, Gov. Jerry Brown declared a state of emergency in Lake and Napa counties, helping free up funding and resources in the firefight. A statement from Brown's office said the move, which follows "damage to highways and other infrastructure," hastens the removal of debris and waives fees to replace birth certificates and other documents. Evacuations are in effect for residents in areas of Lake and Napa counties. A mandatory evacuation has been called for the entire Pope Valley as well as communities of Clearlake Riviera, Riviera West, Cobb, Seigler Canyon, Loch Lomond, Middletown and Hidden Valley Lake, according to Cal Fire. Meanwhile, people have been evacuated from Butts Canyon Road to the Napa County line, including Berryessa Estates, and along Highway 29 from Tubbs Lane to highways 29 and 53 in Lower Lake. Evacuations have also been ordered on High Valley, Bottle Rock and Big Canyon roads. Residents from Point Lakeview to Soda Bay were also evacuated just before 11 a.m. Sunday. Cal Fire spokeperson David Shew, who is in Middletown, told NBC News that the Valley Fire is one of the worst he's seen in terms of devastation in the 28 years he has been with Cal Fire. Cars leaving Middletown were dodging smoldering telephone poles and driving through billowing smoke on Sunday. Residents said there were burned buildings in downtown, but the heaviest damage was farther out, where homes and apartment complexes were destroyed. Javier Negrete told The Associated Press that parts of Middletown have burned to the ground. Teri Molini, who lives on the edge of town, said she started seeing flames within hours of having heard about the fire. She left with her pug and spent the night in Calistoga, about 17 miles away. George Escalona told The Associated Press that parts of his town, including his home, have burned to the ground. In some areas of town "there is nothing but burned houses, burned cars,'' Escalano said, adding that he has nothing left but the clothes he was wearing. The 60-square-mile fire erupted in Lake County — about 100 miles north of San Francisco — around 1:20 p.m. Saturday off High Valley Road and Bottle Rock Road in Cobb and rapidly chewed through brush and trees parched from several years of drought, the California Department of Forestry and Fire Protection said. Entire towns as well as residents along a 35-mile stretch of highway were evacuated. Fire officials reported at 7:35 p.m. that the fire had burned 10,000 acres. They increased the number to 25,000 acres at 10:40 p.m.
"Our hearts are breaking right now," Lake County OES spokeswoman Jill Ruzicka said. She said some people in the emergency operations center had to leave to take care of loved ones. The Red Cross set up evacuation centers at the Napa County Fairgrounds in Calistoga — where Petaluma Animal Services is caring for evacuated pets — and Clearlake Senior Center. 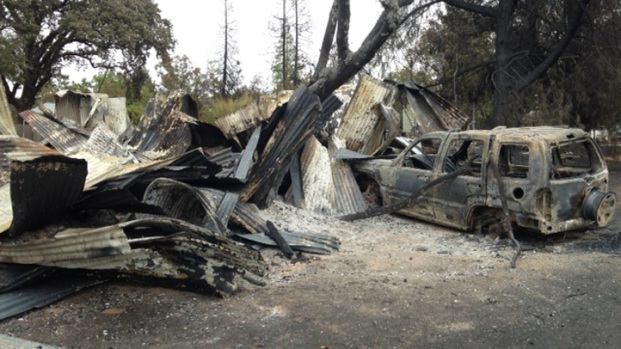 The Kelseyville Presbyterian Church was unable to accept any more people, Lake County officials tweeted at 10:29 p.m. Nearly 300 people spent the night in the shelters, Red Cross officials said in a statement. Another center was opened Sunday at Kelseyville High School, officials said, adding that people can stop by for food, water, medicine, cleaning supplies and support. "Firefighters are doing heroic work in trying to contain the fire and keep residents safe, and it’s our honor to support them in every way possible," Jeff Baumgartner, executive director of the American Red Cross of the California Northwest, said in the statement. "We are working closely with the county officials to make sure all sheltering needs are met, and are prepared to scale up our support if needed." Hundreds of firefighters worked through the night protecting homes, according to Cal Fire spokesman Daniel Berlant. Berlant tweeted that the firefighters who suffered burns are currently in stable condition at UC Davis Medical Center. A light rain started falling in the area early Sunday morning, but according to social media reports, it wasn't doing much to help douse the fire. Lake County is close to where the Rocky Fire and Wragg Fire burned in the past months. 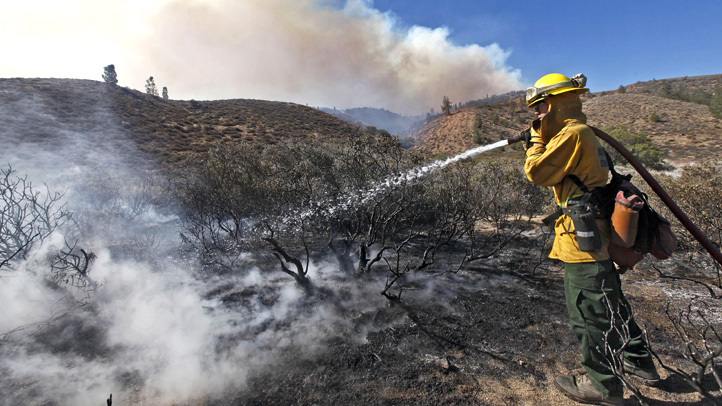 The two fires combined burned almost 80,000 acres. Residents took to social media Saturday night to let family, friends and the public know they were safe. Photos on Twitter and Instagram showed an inferno burning down houses, trees, signboards and other structures. A Facebook group set up for those affected by the Valley Fire had 228 members as of 4 a.m. Sunday. Messages poured in about emergency housing, food, animal and child care and missing people. Some people also wrote about the destruction of the popular Harbin Hot Springs while encouraging others to donate to Valley Fire relief. To the east, firefighters battled a blaze about 70 miles southeast of Sacramento that exploded to more than 101 square miles in four days, turning the grassy, tree-studded Sierra Nevada foothills an eerie white. Crews increased containment to 20 percent despite a thick layer of smoke that kept air tankers and helicopters from flying Saturday. 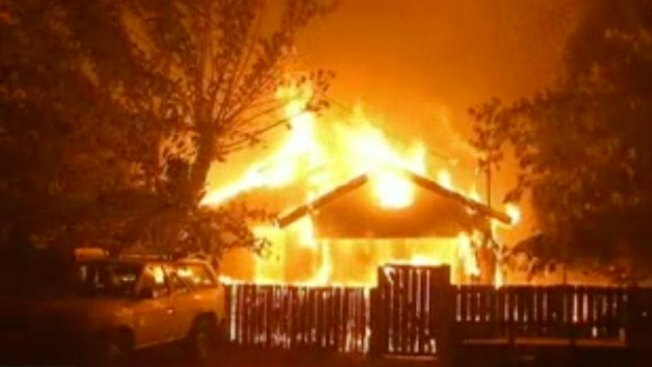 The fire, which broke out on Wednesday, destroyed 81 homes, 51 outbuildings and was threatening about 6,400 more. More than 3,850 firefighters were assigned to the blaze, and more we expected to join the firefight. Thomas, who runs a tractor dealership and repair business, said he and his wife grabbed papers, his work computer, photos and their four dogs. But they left a goat, five ducks, six rabbits and more than 30 chickens behind. Meanwhile, new evacuation orders were issued Saturday for the largest wildfire in the state, threatening to sweep through an ancient grove of Giant Sequoia trees. The fire, sparked by lightning on July 31, has charred 201 square miles, the U.S. Forest Service said. Firefighters cleared brush around the Grant Grove and set prescribed burns to keep the flames from overrunning it. By Saturday, the backfiring and monitoring efforts appeared to have helped protect the treasured trees, the Fresno Bee reported. The grove is named for the towering General Grant tree that stands 268 feet tall. There are dozens of Sequoia groves in the Sierra Nevada, and some trees are 3,000 years old. 4 firefighters from @CAL_FIRE Copter 104 suffered burn injuries this afternoon on the #ValleyFire. Being transported to area burn center. Despite some light rain devolving over the #ValleyFire its having little affect on the fire activity so far many buildings still burning. Advisory evacuation ordered for the Hidden Valley Lake Community as the #ValleyFire continues to burn in Lake County.